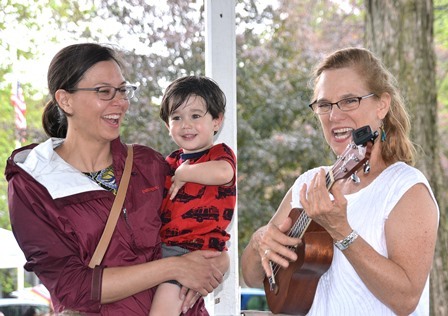 Leslie Bradford and her son Merrill, 2, sing “You Are My Sunshine” along with Miss Jan Barlow of Apple Tree Arts. Grafton – Grafton Public Library (GPL) patrons of all ages had multiple reasons to celebrate June 24. Sudden downpours stopped in time for most of a four-hour outdoor celebration at Grafton Common to commemorate the library’s 90th anniversary and what would have been the 183rd birthday on June 20 of its benefactor Jerome Wheelock. Event hosts were the GPL, Friends of the GPL and Trustees. 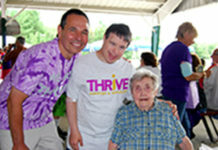 Live musical entertainment was provided from the gazebo by Miss Jan Barlow and Mr. Kim Webster of Apple Tree Arts. Activities included field day games such as potato sack races and tug of war. Participants won raffle tickets for prizes. Kids also challenged themselves on an inflatable obstacle course, badminton games and soccer goal kick. Face and nail painting for children was offered by Girl Scout Troop 11602 and GPL trustees’ children. Henna tattoos were also available. Balloon animals were created by Lee Lee of Just Clowning Around. Kids played in a bubbles zone and families viewed a display of classic 1930s vehicles. Free refreshments served included lemonade, snow cones and slices of birthday cake. A Jerome Wheelock lookalike mingled among guests. In May of this year, Grafton residents approved the design and funding for a GPL expansion of about 26,000 square-feet with an estimated cost of $16.6 million. GPL applied for a state construction grant to help defray the costs. The GPL Capital Campaign is accepting donations at any UniBank location including 89 Worcester St., North Grafton 01536. 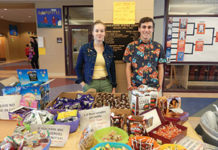 For information about upcoming GPL activities, visit graftonlibrary.org and on Facebook at facebook.com/GraftonPublicLibraryMA. 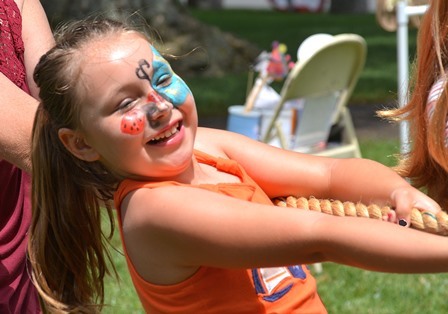 Katlin Fisk, 8, competes in a tug of war. 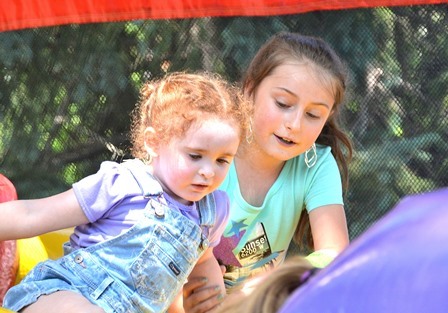 Lily Banks, 3, gets help on an inflatable obstacle course from Sarah Hogan, 8. 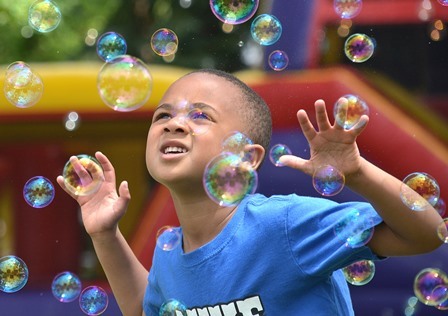 Marcus Jackson, 5, plays in the bubble zone.